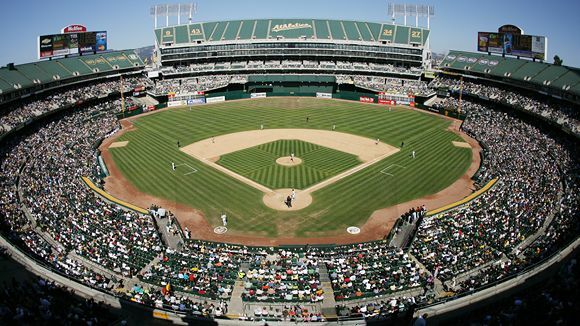 Oakland’s O.Co Coliseum has a reputation for being one of the worst parks in baseball. The sightlines are bad, the stands are far from the field of play, and the whole park feels outdated and just plain blech. Whenever I watch A’s games, the stairs in left field always seem to catch my eye. There’s no way they could be for football because baseball is the only sport in the world. So I always ponder about what the stairs are for, but I’ve never found the answer… until now. Here is a closer look at the aforementioned stairs. Just imagine a slip and slide down those stairs. You can totally imagine kids sliding down during games and smashing right into the back of the wall. At night when there’s no one around, I bet you Eric Sogard and his wife come sneak to the park and lay out a giant tarp over the stairs. Then they soak it in water and soap and put on their bathing suits and slide down like children. Nobody likes to talk about the one night that Billy Beane caught them…. Take a real close look at the picture again. Do you see anyone out there at the top of the magical stairs. Yes, yes. What is that figure just below the bud sign. Lets take a closer look. Holy Russel Branyan Batman it’s the magical unicorn Billy Beane. The A’s GM must use the stairs as his secret hideaway during baseball encounters to watch his team from a distance. THIS MUST BE WHERE HE DFA’D ADAM ROSALES. Wow, what a find. That must where he’s been hiding Jonah Hill this whole time. Well egad, I certainly didn’t see this coming. I know you ruled out football, but that is exactly what they’re for, by the fans who sit i nthe bleachers that are folded up in the outfield during baseball games and rolled out for football games.